EVEN as a child, champion racer/mountaineer Jonathan Pido constantly tried to outdo himself. A native of Carmen, Davao del Norte, Pido came from humble beginnings—the son of a farmer, Pedro Pido (now deceased), and Vivien, a food vendor. Pido, a police officer by profession, was the grand-prize winner of the 1st International Mt. Apo Boulder Face Challenge held last year in Sta. Cruz, Davao del Sur. He, along with his team mates Angelito Sibayan and Edwin Bueno (Team Carmen), bested 18 local and foreign teams, and clocked in at 22 hours, 51 minutes, and 42 seconds. The team won $3,500 (about P154,000) and a trophy for its effort. I met him at the recent press briefing to announce the 2nd International Boulder Face Challenge, which will be held on April 28 and 29. With neither “hiking” nor “mountain climbing” in my vocabulary, I wanted to discover for myself the stuff champion racers/mountaineers were made of. The second to the last child in a brood of 12, Pido said when his father passed away, “naghiwalay-hiwalay na kami.” Some of his siblings went to find work in Manila, some went abroad, while he and a few others stuck close to home. All the siblings, he said, now help out to support their widowed mother. Despite the family’s financial circumstances, Pido wasdetermined to continue his education and graduate from a university, hoping to become a soldier or a police officer. He said he was inspired by his relatives who were in the Philippine Army and in the police force. “I was attracted to their keen sense of leadership, and their self-discipline,” he explained in the vernacular. To support himself in his studies, he worked in a banana plantation tending to the flowering plants, then as a bagger wrapping huge plastic bags around the fruit bunches. “It’s backbreaking work,” said Pido half-chuckling and wincing at the memory. He said he had to wake up at 4 am to be at the plantation by 6 am for “assembly time”, and work continued until 2 pm, just as the sun was shining at its mightiest. By 4:30 pm, he was off to school where classes lasted until 9:30 pm. Amid his hectic work and school schedules, Pido said he still managed to find time to join school clubs, become an officer in the Student Council, and even help in the local Kiwanis chapter. In college, he joined the varsity volleyball team to help defray his tuition. His hard work and focus on his professional goal paid off. Armed with a Bachelor of Science degree in Education from the University of Mindanao-Panabo College, he applied at the Philippine National Police and passed its entrance exam in 2009. Pido has been a cop for three years now. As P01 with the Regional Public Safety Battalion, 2nd Maneuvering Company of the PNP Region 11 Command, Pido helps beef up the checkpoints in Davao to ensure that the city and its surrounding environs are always safe from criminal elements. He said he took up mountaineering in 2007 and first climbed Mount Apo with newfound friends from the Panabo Eco-Adventures and Keepers. “Matagal ko ng gusto mag-mountain climbing, at umakyat ng Mount Apo,” he said. “Why?” I asked. “Wala lang, out of curiosity,” he answered. But I sensed it was probably due to a desire to again challenge himself with some new activity. It’s easy to comprehend why Mount Apo holds an immense allure for mountaineers and other extreme sports enthusiasts. At close to 10,000 feet, it is the highest point in the Philippines. 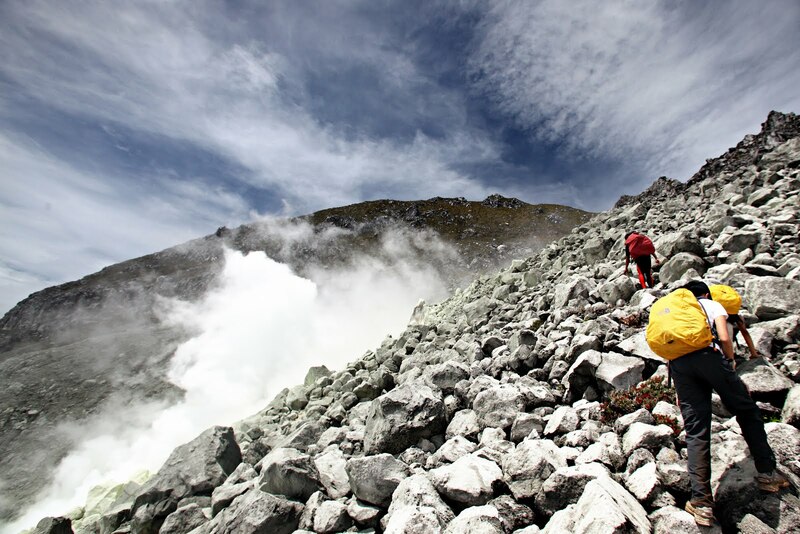 According to pinoymountaineer.com, the still active volcano “possesses a formidable array of landscapes, from craggy rockscapes to virgin forests; from mossy swamps to volcanic structures,” thus offering “the widest spectrum of environments” for climbers. Despite their relative expertise in climbing Mount Apo, Pido and his teammates still faced quite a few formidable challenges during the race. One was the sulfur emissions from the volcano—they didn’t have masks to protect themselves from the fumes. And second was battling hypothermia. 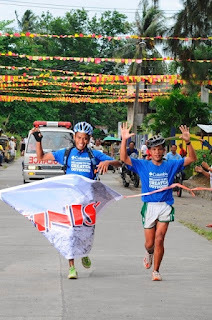 Pido said the team reached the peak at 10 pm, or 12 hours after they had set off from the Municipal Plaza in Sta. Cruz, the starting point of the race. By then, he said, the temperature at the summit was freezing and they were garbed only in singlets (sleeveless running shirts), their shorts, and running shoes. “Wala kaming pang-ginaw,” he said. Fortunately, they stumbled on cellophane bags which they used to wrap themselves with and keep warm. Because it was a race, there were no breaks except at the designated checkpoints, and to eat their meals. “Ang baon namin pork adobo at kanin, at saka mga energy bars. Kailangan mo talaga ng kanin para sa carbo-loading, para me energy ka umakyat,” Pido explained. According to Art Boncato, regional director of the Department of Tourism Region 11 (Davao Region), the Boulder Face Challenge was first held in 2008, but in 2011, they decided to encourage international teams to attend as well. The event is one of the highlights of the annual Pista sa Kinaiyahan (Feast of the Environment) of the municipality of Sta. Cruz. Boncato said the annual competition has made the region of Davao a leading destination for eco-adventure tourism. It has also helped increase awareness about the importance of protecting the environment. This year, organizers expect participants to reach the maximum 35 teams—each team consisting of two racers and one logistical crew. Declared a national park in 1936 and a protected area in 2004, Mount Apo is home to the Philippine eagle, and hundreds of other critically threatened bird and plant species. The national park is on the tentative list of Unescoas a World Heritage Site. Still unmarried (“Gusto ko muna makapag-invest para ‘pag panahon na, at least handa na ako.”), Pido said he intends to join this year’s challenge and is quite focused on winning again. And maybe someday, he said, he’ll make it to the top of Mount Everest as well. To join the 2nd International Mount Apo Boulder Face Challenge, register online at www.boulderface.com.